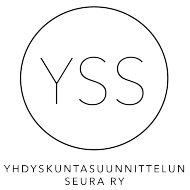 The Finnish Society of Urban Planning (YSS ry) is founded in 1958. The aim of the society is to function as a discussion arena for planners, researchers and other interested. Our activities are both scientific and practical. We organize conferences, seminars and discussions. Professional excursions of different themes are also arranged and promoted on Facebook and Twitter. The Finnish Society of Urban Planning publishes a scientific journal called “The Finnish Journal of Urban Studies” four times a year. We have about 350 members. The Finnish Society of Urban Planning is a member of Federation of Finnish Learned Societies.